In Duet Enterprise for Microsoft SharePoint and SAP, the Customer Collaboration Workspace provides a list of quotations from your SAP business data. In the customer workspace, you can open an individual quotation in a workspace and view details such as sales order items, reports, related documents, and so on. Need more information on collaboration workspaces? See Getting started with collaboration in Duet Enterprise. You can view the quotations for a particular customer in the Customers list. Important: If you experience issues displaying customer data details, or notice that the information about customer or product details is hidden, please refresh your browser to make the details appear. In the Duet Enterprise Web site, on the top-link navigation bar, click Customers to open the customers workspace. In the Customers list, click the dropdown next to an item for which you want to open the workspace, and click Open Workspace. Note: If you are opening the workspace for the first time, you may be asked to confirm that you want to create the workspace. Click OK.
On the Quick Launch bar, click Quotations. To view more details of a particular quotation in the list, click a link in the Quotation ID column. Note: Alternately, you can click the dropdown menu next to the link and click View Item. This opens the quotation details in a separate window. You can view quotations for a particular customer in the Customers list by opening the quotation workspace. In the Quotations list, click the dropdown next to an item for which you want to open the workspace, and click Open Workspace. Communicate with your colleagues relevant to the quotation. You can send an email, chat, call or even schedule a meeting with a colleague in the list. You can invite anyone from your domain to be a Contact on your collaboration workspace, even people without permission to access the workspace itself. This allows you to consolidate all your relevant information and contacts without regard to their permissions. Note: Adding people as contacts does not authorize them as users to the Duet Enterprise Web site. To receive access, a site administrator or an owner has to first add them as users to the Duet Enterprise Web site. For more information, see the See Also section. Click Add new item to add colleagues to your contacts list. View a brief description and other details about the quotation. View the sales items associated with the quotation. 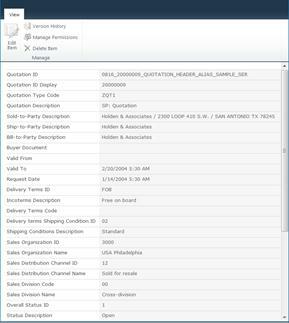 View any relevant documents that apply to the context of the sales item. Note: To view documents in the Related Documents Web Part, you have to first select an item in the Sales Items Table Web Part. You can also upload relevant and useful documents that you want to share with other users who come to this workspace. Under Related Documents, click Upload Document. On the Upload Quotation Item Document – Upload Document page, click Browse to browse and select a document. On the Upload Quotation Item Document – <Document file name> page, enter values into the required Type and Storage Location fields, and then click Check In. Important: The site designer specifies the values that these fields require. If you do not know the correct values to select, contact your site administrator. Under Sales Items Table, click the icon next to an item. Click the Download Document link that appears below the Web Part. Click Open or Save depending on what you want to do. View the Sales and Distribution details such as Sold-to party, Bill-to party, Payer, and Ship-to party. View the reports and actions depending on the context of the workspace. In the quotation workspace, the only available report is General Quotation Information per Customer. Click on a link to open the report or action. View reports relevant to the quotation. Any report you run in the Related Actions Web Part will display in the Reports Web Part. You can initiate or respond to a discussion thread. You can also set up alerts for yourself to receive notifications if someone replies to a thread.